Saturday: 7:30 a.m. - 11:00 a.m. If the answer is “no” or “I am not sure”, now is the time to connect with us. A microchip is a permanent form of identifcation for your pet. It is approximately the size of a grain of rice and is administered between your pet’s shoulder plades. We never expect our kitty to sneak out the door as the kids are racing in and out of the house. We never expect our pooch to bolt when the fireworks go off. But it happens. If your furry family member gets out and is scooped up by animal control or brought into a vet clinic, they will scan him for a microchip. The microchip contains a unique identification code. This ID code is linked to your information. This allows you to be reunited with your pet fast! One out of three pets will go missing in their lifetime. That’s scary. If your pet is microchipped, it increases the chances of being reunited by over 90%. Do you know which day pets go missing the most? The 4th of July. That’s less than a month away. I Want To Get My Pet Microchipped, What Now? Set up an appointment with us and we can implant the chip. The cost of having the microchip implanted is $49.35. To have the microchip registered, it typically costs $19.99. This month, we are covering the cost of registration for you! Spring has arrived in Iowa! With the warmer weather comes flowers blooming, spring cleaning and lots of rain! This means there are potential springtime hazards for your furry companions. When spring arrives, we know that Easter is not far behind. With Easter comes lilies and candy, items that are very toxic to pets. 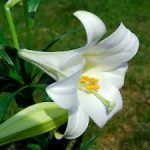 If ingested lilies can be fatal to our feline friends, even with just a few bites. Chocolate goodies are also toxic to both dogs and cats. The plastic grass in Easter baskets can also cause an obstructed digestive track, causing severe vomiting and dehydration. If you suspect your pet has ingested any of these items, it’s time to visit your Veterinarian. The rainy and wet season increases the risk of your dog contracting Leptospirosis, a bacterial disease that is spread by wild anim als. Leptospirosis (lepto) can cause liver and kidney damage. It is also zoonotic, meaning we (humans) can also contract lepto. We carry a vaccine that protects your pooch against the 4 most common strains of lepto. When the weather starts to get warm, we open the windows to welcome the breeze in. Our felines love to lounge in the window sill. 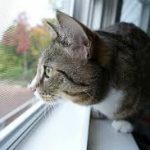 Double check to make sure your screens are secure to prevent your cats from falling or jumping out. Keep those house cleaners and fertilizers away from your pets. Almost all cleaning products contain chemicals that may be harmful to our pets. Store your fertilizers, insecticides and herbicides out of reach of your pets. Follow the instructions on the label carefully to ensure your pet’s safety. Spring can be a prime allergy time for pets just like us. Pets typically express allergies through their skin. If your pet is itchy, biting at his feet or skin seems irritated, there are many things we can do to help them feel more at ease. Fleas, Ticks and Mosquitoes, Oh My! With Iowa weather, we see this pesky critters throughout the year and recommend preventive all 12 months of the years for both dogs and cats. If your pet is not on parasite prevention, now is the time to start! To set up an appointment to see the doctor, click here. You can also contact Pet Poison Helpline for immediate assistance. New Puppy or Kitten? Save 10% on our Puppy & Kitten Packages! Holiday Tips With Your Pets! Buy 2, Get 1 Free! 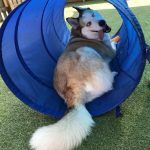 All Toys & Treats: Mix & Match! The materials offered on this website are intended for educational purposes only. South Des Moines Veterinary Center does not provide any veterinary medical services or guidance via the Internet. Please consult your pet’s veterinarian in matters regarding the care of your animals. ©2019 South Des Moines Veterinary Center. Veterinary Website by Beyond Indigo Pets.